Hawthorn Woods is a beautiful community of spacious neighborhoods amid the picturesque surrounding woods and lakes, and residents take great pride in the appearance of their homes. A broken or damaged garage door can mar the serenity of your neighborhood and lower the property value of your home. So when you need garage door repair services in Hawthorn Woods, don’t let the blemish become a permanent scar. 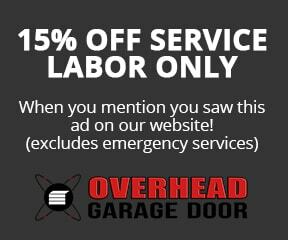 Call the trusted professionals at Overhead Garage Door Inc. right away. As a certified dealer of Clopay Garage Doors, Overhead Garage Door Inc. is a leader in the industry. We provide home and business owners in Hawthorn Woods an excellent value on superior products—plus service that is second to none. Our ongoing mission is to go above and beyond your expectations while helping you improve the aesthetic appeal and property value of your home or business. Clopay offers customers a huge variety of styles so that you can completely customize your garage door and be proud to display the finished product. Garage opener or door installation is easy when you trust it to our highly trained and experienced professionals. Our technicians can install any of our wide selection of products and make necessary repairs quickly and affordably. They are not only knowledgeable and courteous, but also totally dedicated to providing Hawthorn Woods homeowners with 100% satisfaction with our services. Overhead Garage Door Inc. can fix any problem you might have with your garage door, be it a dent from an unfortunate accident, blemishes or major breaks from weather damage, or minor flaws. When you trust us with restoring your door’s original beauty, we will arrive promptly, look over the problem and discuss every possible solution with you, and provide you with a comprehensive estimate before we perform any repairs. We even provide emergency services, so you can call our technicians any time, day or night. Product Lines: Home and business owners in Hawthorn Woods are welcome and encouraged to review our entire line of products below, and we hope to help you with your every garage door need. Do you want to have pride not only in your home, but also the tranquil community of Hawthorn Woods? Call us today and let us help you reach your home improvement goals. I have three different garage door openers for my house, work and vacation house. My new puppy decided that just because they were in reach they must be tasty and while I was in home depot for all of 20 minutes, you wouldn’t believe what those little teeth could do. I called Overhead Garage Door to see if they had a recommendation to replace the units and to my surprise, THEY HAD THEM in STOCK! What a relief! Scott K is a great representative of the company. Thank you for the great service.